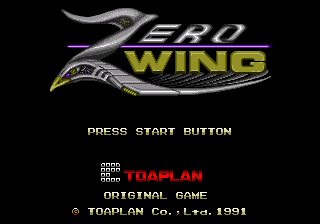 Zero Wing (ゼロウイング) is a 1989 arcade shoot-'em-up video game developed by Toaplan, and ported to the Sega Mega Drive in 1991 for Japan and Europe release. It is one of the few Mega Drive ports developed by Toaplan themselves. It has a very different-sounding arrange of the original arcade soundtrack, focused around the popular Cube sound driver. and shoot. fires a suction beam that will trap enemies, allowing the ship to grab certain enemies. Letting go of launches the enemy at high speeds, allowing you to destroy other enemies with it. Some heavy ships will pull the player ship down. While there are no gameplay differences between the arcade version and its ports, the Mega Drive port added an in-game storyline with cutscenes. This is all well and good, but the English translator chosen was the kind of guy who "thought" he knew English. Long story short, the English introduction is ridiculous to the point where "ALL YOUR BASE ARE BELONG TO US." has become a meme that is far more popular than the game itself ever will be. Main article: Zero Wing/Magazine articles. NEC Retro has more information related to Zero Wing.